Let me start by answering an obvious question: I wore a T-shirt and ski pants. 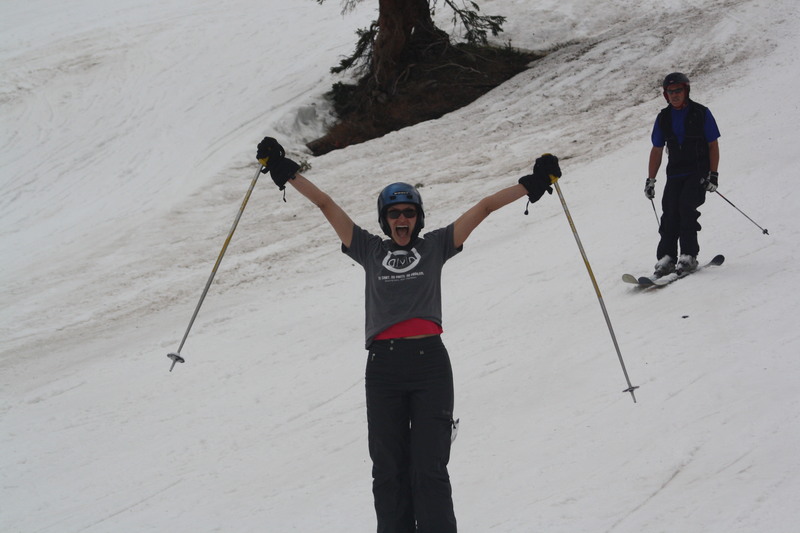 Now that the “what did you wear” question is out of the way, let’s talk about the fact that I SKIED on the Fourth of July. Like, on snow. In 60-degree weather that made me regret not joining the bikini-wearing masses in the early part of the day (though when the sun hid behind the clouds and the wind picked up in the afternoon, I was very, very happy about my wardrobe choice). 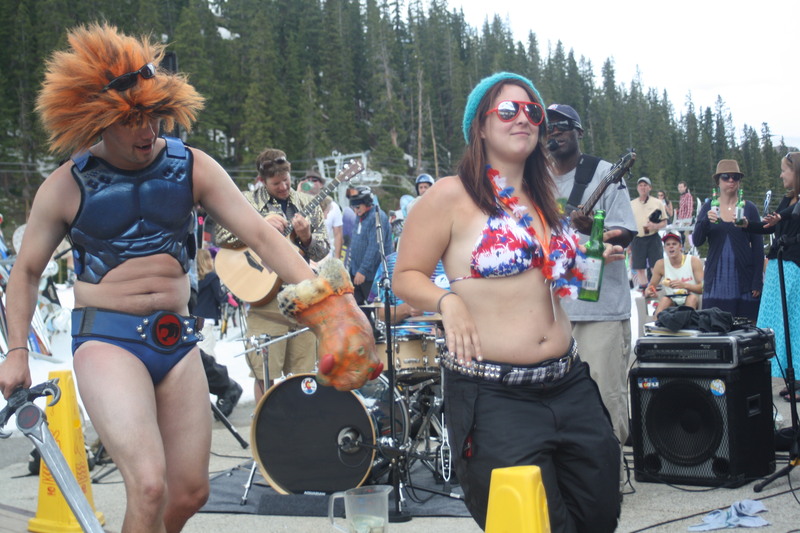 Bikinis=easy target in the massive snowball fight that broke out in the lift line. Colorado’s epic snowfall last winter led many resorts in the state to push their closing dates into late spring and early summer. 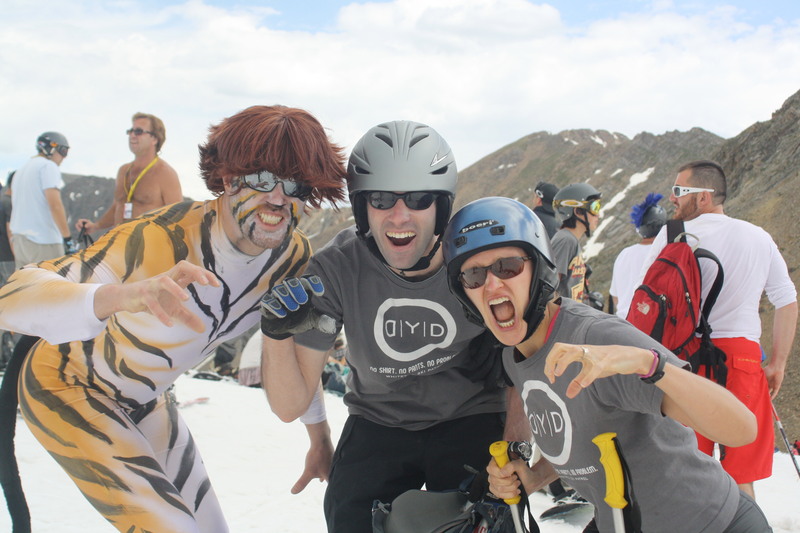 Naturally, as soon as Steve and I learned we’d be attending his family reunion in Denver over the Fourth of July weekend, we started keeping our eyes peeled for Arapahoe Basin’s closing date—which turned out to be July Fourth. 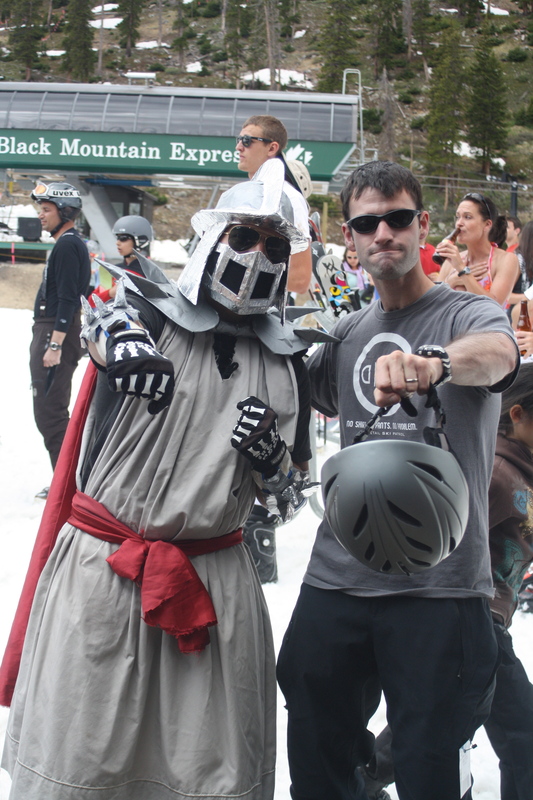 Arapahoe Basin is one of mine and Steve’s favorite resorts. 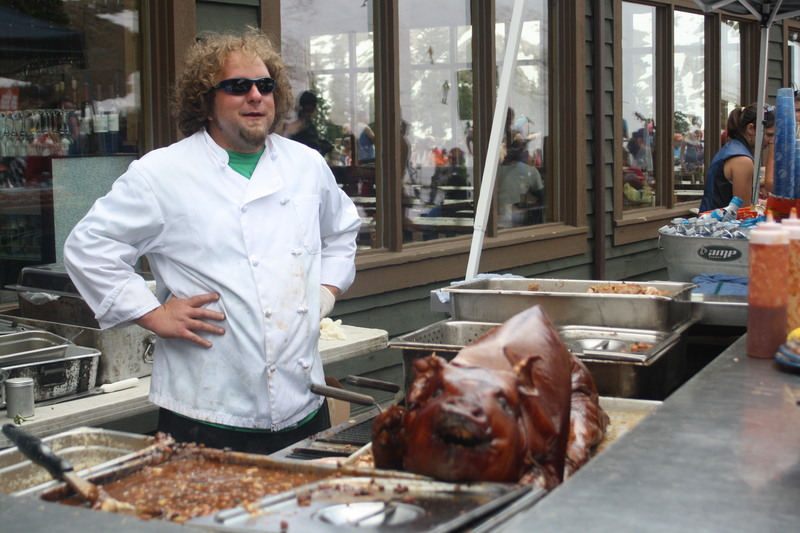 It’s known for being a bit less commercial than its big-name counterparts, and for closing later than other resorts nearby thanks to its higher altitude (about 10,000 feet). 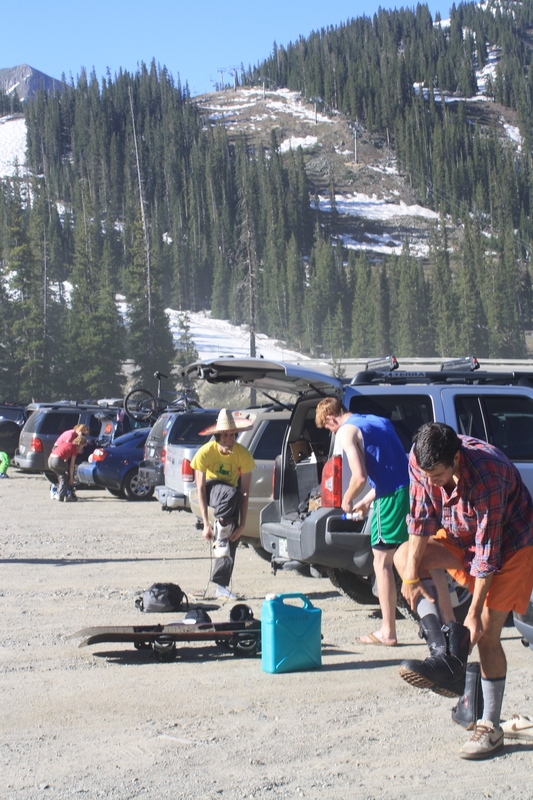 It’s not unusual to see dudes cracking open beers while putting on their ski boots in the parking lot. What is unusual: Seeing those dudes wearing sombreros and no shirts while doing all of the above. 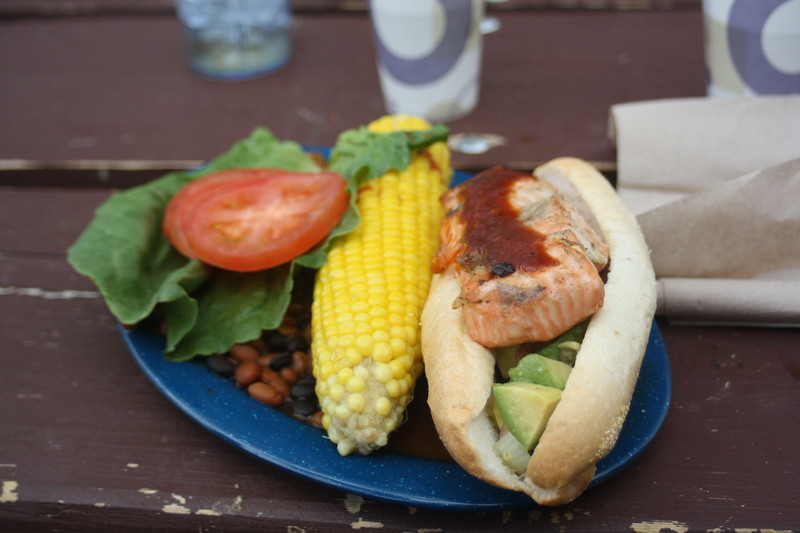 When we walked into the base lodge, we saw a few guys drinking tall boys of PBR while eating Froot Loops. We saw Uncle Sam hats and sparkly red, white and blue shirts, girls in bikinis and guys in Speedos. A LOT of guys in Speedos. … to a guy in a skin-tight tiger suit. 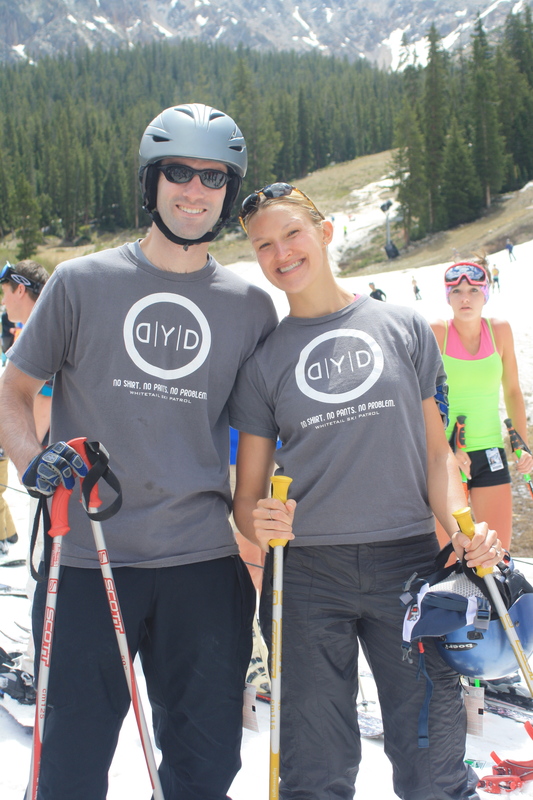 Steve and I both decided early on we’d wear ski pants and T-shirts, and Steve had the brilliant idea to wear our “DYD” shirts from our Whitetail ski-patrol Outdoor Emergency Care class. This was especially appropriate for me, since this was my first day of skiing since a tiny, human-shaped missile slammed into me during my first day of on-the-snow ski-patrol training in January, tearing my ACL. I can’t tell you enough how confidence-boosting it was to road-test my knee, which I was medically approved to ski on again last week. My first run wasn’t fear-free, but that fear quickly gave way to confidence, strength and pride. By the end of the day, I even skied a respectable bump run. 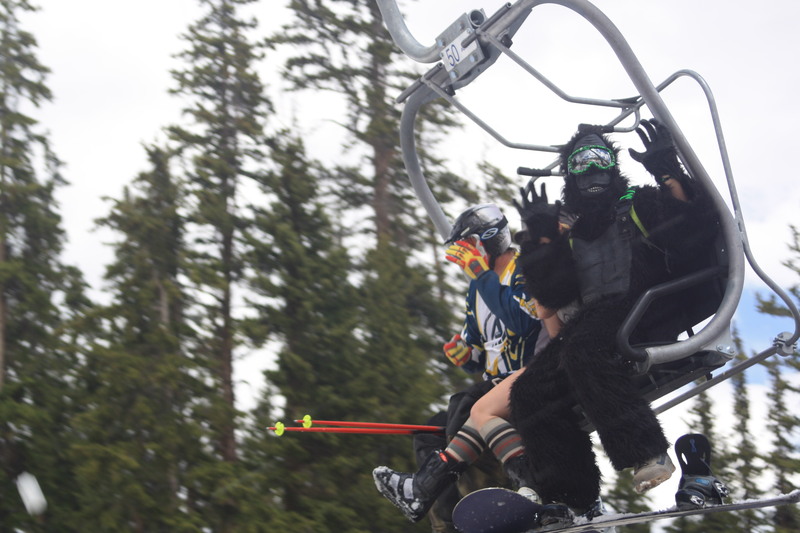 … while the guy in the full gorilla suit made out just fine. We’ve been dealing with some stressful stuff recently, and I am happy to report that it’s physically impossible to hold onto stress or anxiety while participating in a snowball fight in the middle of the summer. I’m also happy to report something that probably seems obvious to you: My knee works better than ever! It’s going to take a while before I feel comfortable doing one-legged drills on that leg. But skiing on the Fourth gave me something I’ve been yearning for all season: a victory in a sea of disappointments and stresses. The last time A-Basin stayed open to July Fourth was in 1997, 14 years ago.The resort has been open on July Fourth four times, in ’93, ’95, ’96 and ’97. 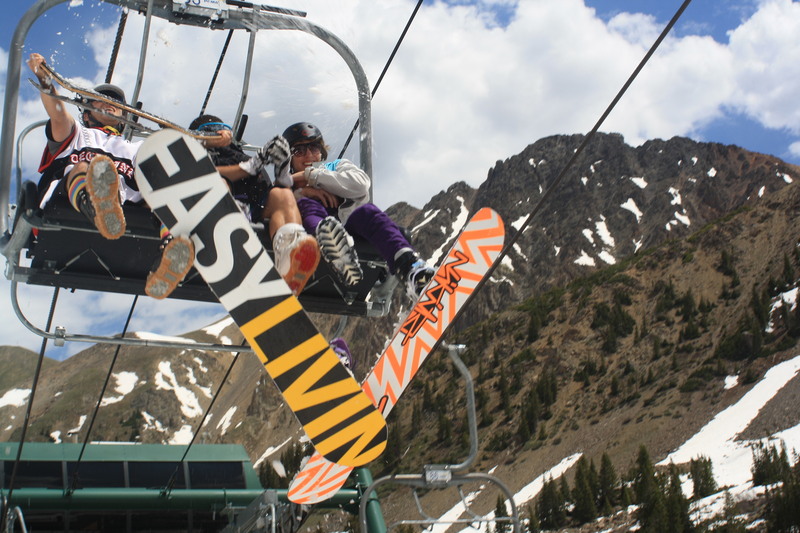 In 2003, A-Basin stayed open until July 2; warmer temperatures and lack of snow coverage stopped the resort from reaching July 4. 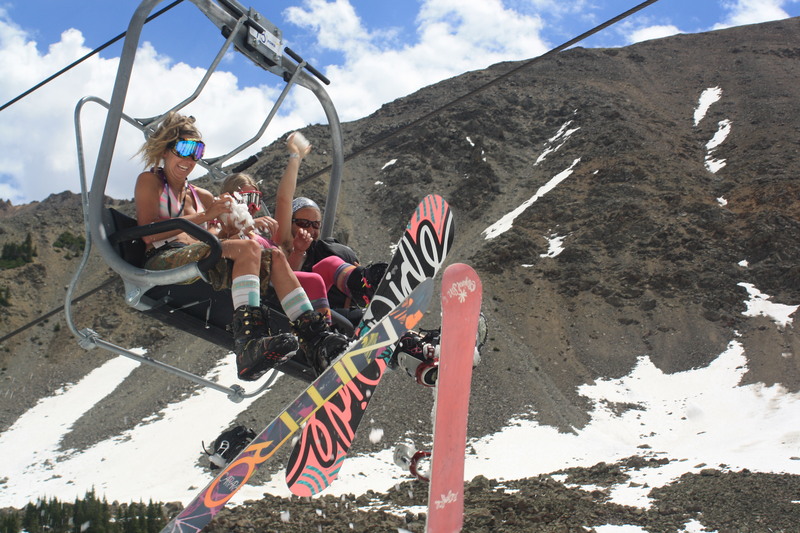 In 1995, A-Basin stayed open until August. Curious about the conditions? The snow was a little bit slushy and sticky, but it’s nothing we haven’t experienced in Pennsylvania in March. Yay for skiing! Go you!! This is so cool! I’m both jealous and impressed. Congrats! Fantastic photos, Amy! 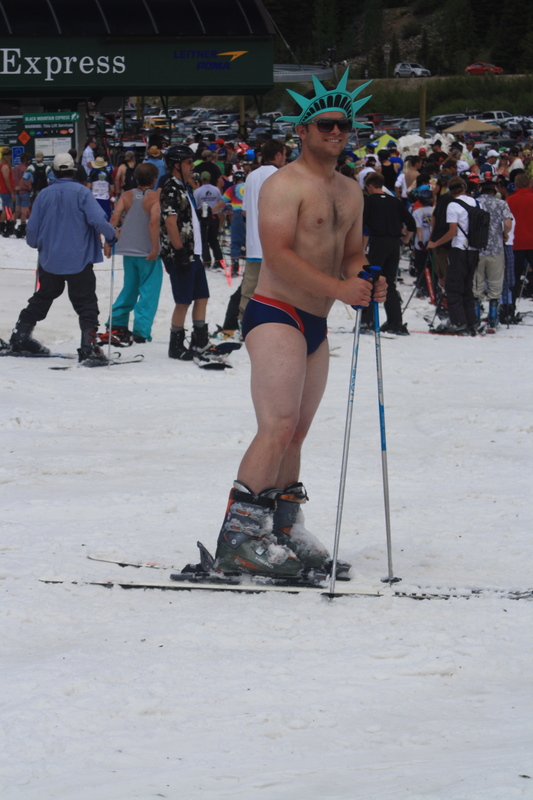 I love warm weather A-Basin skiing. My favorite is the “lake” that everyone tries to ski across – I’m guessing that slope isn’t even open in July. And HOOOOOOOOOOOOORAAAAAAAAAAAAAAAAAAAYYYYYYYYY FOR YOU BEING HEALED AND SKIING AGAIN!!!!!!!! Well done. And I am so happy to see you out again. The picture of you throwing your poles in the air made me so happy. You look fantastic, and happy, and I’m SO GLAD you are skiing again!!! No more injuries for you!! You were in CO over the 4th?? (Obviously I know the answer to that, now 🙂 ) So cool! We chose to test our altitude tolerance on a hike vs. test the weather for skiing, but I love these photos – so fun!